Signs show the hopes Donald Trump expressed for winning the Iowa Republican presidential precinct caucuses during this campaign stop at the University of Iowa Field House on Tuesday, Jan. 26, 2016. Democratic caucus-goers at the University of Northern Iowa’s Maucker Union in Cedar Falls, Iowa, the night of Feb. 1, 2016. New Hampshire and Iowa set the stage for passionate voter participation during the nation’s first presidential primary and first presidential precinct caucuses. Chalk it up to hotly contested nomination campaigns in both the Republican and Democratic parties. The passion was abundant particularly among billionaire Donald Trump and Vermont Sen. Bernie Sanders supporters who connected with calls by the Republican and Democratic primary winners in New Hampshire, respectively, for a new approach in Washington. Ranee Washburn of Concord, New Hampshire, said voters like Trump because he’s not a politician. “People are sick and tired of the government,” Washburn said. 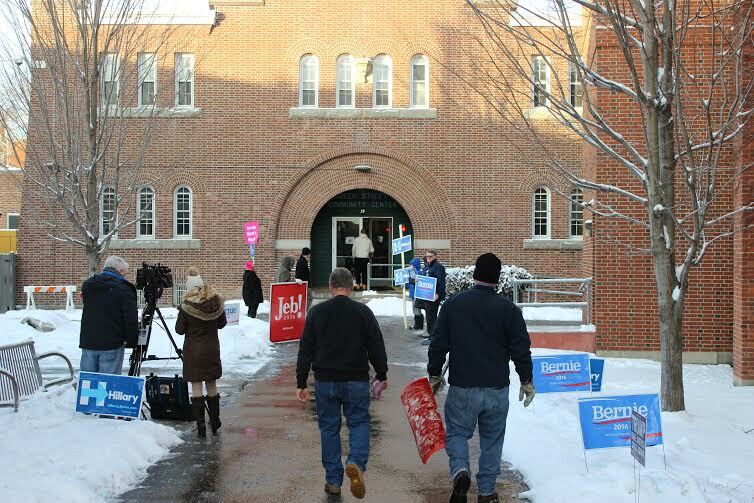 Voters had to shovel out before hitting the polls Tuesday, Feb. 9, 2016, in Concord, New Hampshire. They also like Texas Sen. Ted Cruz, but if Trump is the last Republican standing on election day, he can count on both of their votes over either former Secretary of State Hillary Clinton or Sanders. “Bob said he’d hold his nose,” if the GOP candidate does in fact turn out to be Trump, but would vote for him anyway, Washburn said. Folks in Merrimack, New Hampshire, were voting later than usual because of a traffic snafu Tuesday when CNN projected at 8 p.m. local time what ended up being runaway victories for Sanders and Trump in the state’s first-in-the-nation primary with only 3 percent of the vote counted. Sanders, who lost by .2 percentage points in the Iowa caucuses, trounced Clinton 60 percent to 38 percent on the Democratic side. Trump, who lost to Cruz in Iowa, enjoyed a spectacular win in New Hampshire taking 35 percent of the vote, leaving Ohio Gov. John Kasich pleased with a 16 percent second-place finish. Cruz ended the night with 12 percent, while Florida Gov. Jeb Bush and a chastised Florida Senator Marco Rubio tied at 11 percent. Gov. Chris Christie took his family home to New Jersey to re-evaluate his candidacy after getting only 8 percent; Fiorina took 4 percent and Dr. Ben Carson ended up with 2 percent with 89 percent of the New Hampshire vote counted Wednesday morning. In true New Hampshire presidential primary tradition, Chris Cook of Barrington, New Hampshire, met the candidate who eventually would earn his support more than once since last September. Cook, 53, a baker at the University of New Hampshire in Durham, liked what Christie had to say. “I met him at the Seafood Festival last September and again in Portsmouth,” Cook said. “I told him to hang in for the long haul.” That looked increasingly unlikely late Tuesday. Cook said it’s about the economy for him and pointed to the Radio Shack store that has shuttered its doors at the other end of the Lee, New Hampshire, shopping center as he was leaving Market Basket with groceries Tuesday night. These are among the takeaways voters in Iowa and New Hampshire left for the upcoming South Carolina Republican primary on Feb. 20, the same day Nevada Democrats caucus, but also the Feb. 23 Nevada Republican Party caucuses and South Carolina Democratic primary on Feb. 27 before Tuesday, March 1. That day features primaries or caucuses in 12 states, American Samoa and for Democrats abroad. Clinton’s supporters knew the dismal poll numbers for their candidate before the New Hampshire primary, but perhaps didn’t believe they would hold true. They did. Some already were putting her razor-thin win in Iowa into perhaps a hopeful perspective for their candidate as they looked ahead to the rest of the primary season. Clinton won 49.8 percent of the support in Iowa’s Feb. 1 Democratic caucuses. Sanders won 49.6 percent. In defeat, Clinton ended Tuesday night insisting she still loves New Hampshire while Sanders promised to keep his momentum going. Denise Blaha, 53, who works at the University of New Hampshire’s Institute for the Study of Earth, Oceans and Space, said she voted for Sanders despite calls from Gloria Steinem and former Secretary of State Madeleine Albright to support a potential first female presidency. 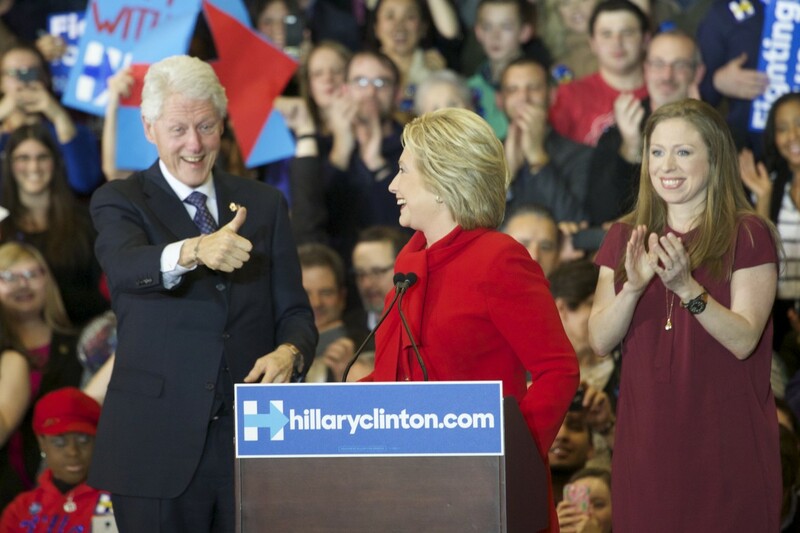 Husband and former President Bill Clinton gives wife and current presidential candidate Hillary Clinton a thumbs-up as she addresses a crowd of her supporters at Drake University in Des Moines, Iowa, after the Feb. 1, 2016, Iowa precinct caucuses. The couple’s daughter, Chelsea Clinton, also was at the post-caucus rally. “I feel he best exemplifies the quality of a president and what’s important to me,” Blaha said. How does she respond to people who say Sanders can’t go all the way after New Hampshire? “He can’t go all the way if we don’t come out and support him,” Blaha said. Blaha said she is deeply concerned about the leading Republican contenders. “I find it repugnant some of the statements that have been made by Republicans,” Blaha said. James Kelliher, 18, of Dover, New Hampshire, said he wants to go to college next year and epitomized what Sanders means to young voters here. “Hillary lost, that’s what counts,” Kelliher said. He doesn’t trust that she would do what’s right for the country. “And (Sanders) is going to give everybody the shot they need and the one’s they deserve. Hopefully I’ll get some grants for college,” he said. Cruz found himself having to recharge his appeal to the anti-Washington sentiment that gave him the Iowa caucus win. Yet voters in Iowa showed that Cruz’s hammering on themes such as throwing military might at defeating ISIS and cracking down on immigrants in the United States without legal documentation can provoke an emotional response in some Republican voters. Cruz won 27.6 of the preference vote taken at Iowa Republican caucuses on Feb. 1. Trump was second with 24.3 percent and Rubio was close at third with 23.1 percent of the vote. Ben Carson finished fourth with 9.3 percent. Kasich, who scored at second place in New Hampshire, won only 1.9 percent of Iowa’s Republican preference poll. 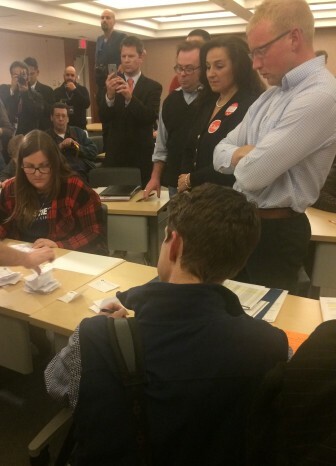 Republicans vote in a preference poll before selecting delegates to a county convention at the start of the caucus process in Iowa while Democrats form viable groups and select delegates committed to candidates. One of the story lines emerging from Iowa and New Hampshire is whether or not Rubio can regain any momentum he took into New Hampshire from Iowa. 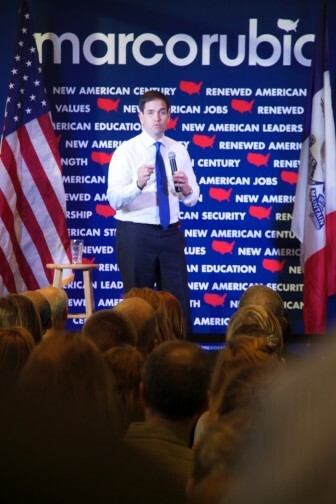 Republican presidential candidate Marco Rubio on the campaign trail during a University of Iowa visit on Dec. 10, 2015. Rubio had success in Iowa in caucuses such as one in downtown Des Moines, populated by urban professionals. “Sen. Rubio really pulled it out here,” that precinct’s chairman, Tyler Campbell said. But on Tuesday in New Hampshire, Rubio apologized to his supporters for his recent debate performance when Christie called him out on his robotic campaign rhetoric. He took responsibility for the damage done, although by tying Bush he can at least stay in the race. “I did not do well on Saturday night so listen to this, it will never happen again,” Rubio promised. Some voters wondered about the future for Carson and Fiorina. This story is a collaboration of IowaWatch.org and InDepthNH. Brittany Robb in Des Moines, Payton R. Van Vors in Dubuque, Mackenzie Rappe and Justice Gage in Storm Lake, and Leziga Barikor in Cedar Falls contributed reporting from Iowa for this story. This IowaWatch story was republished by The Hawk Eye (Burlington, IA) under IowaWatch’s mission of sharing stories with media partners. 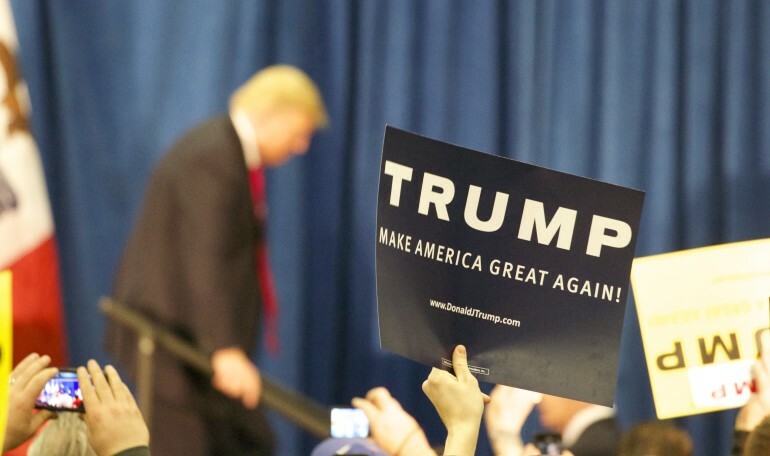 Steve Reed remembers a different kind of presidential campaign from when he was young. They did not last as long as they do now, the Carlisle Republican said.